If your theme support multi level drop down menus, and you try to create a drop down menu using the WordPress menu editor (Appearance > Menu), then you will find no clue about how to add a child menu item below a parent menu item. 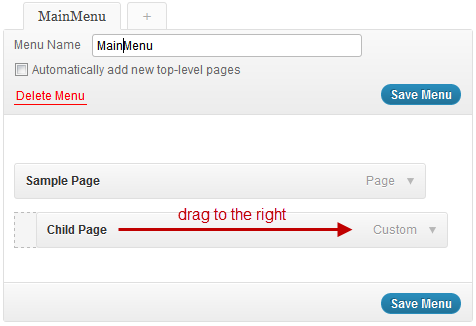 Actually Its very easy to create multi level drop down menus using WordPress custom menu editor. To make a menu item a child of another item, simply drag it slightly to the right under the parent. The menu items that are slightly to the right, that is, the nested items will appear as child menu items in the front end of your WordPress website. Great thank you! So many tried and finally decided to search plugin for multi-level menu.